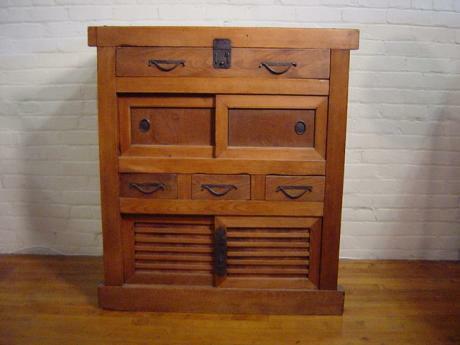 Japanese late 19th Century KEYAKI wood TANSU. The outer parts of the TANSU is made of KEYAKI wood and the inner parts are made of HINOKI wood. The TANSU measures 30 1/4" tall by 28 3/4" wide by 17 1/4" deep. CHOBA-DANSU, or Merchant's TANSU. 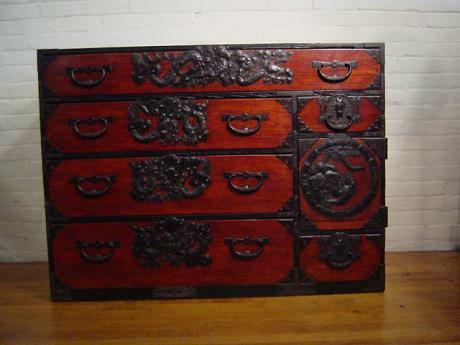 A wonderful example of a Merchant's tansu. This one comes with a large drawer on top, a storage area with 2 doors, a layer of 3 small drawers and with another layer with 2 doors with a storage area on the left and 2 layers of drawers on theright. 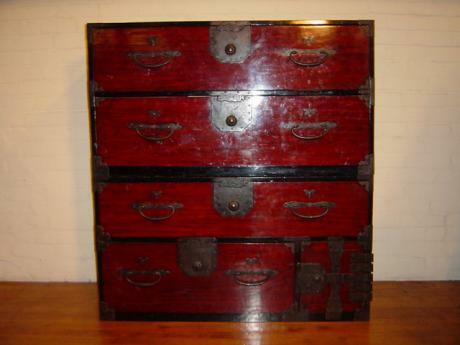 41 1/2" tall, ..
Japanese late 19th Century clothing TANSU. Made of KIRI wood. The hardware has the design of fans in them. 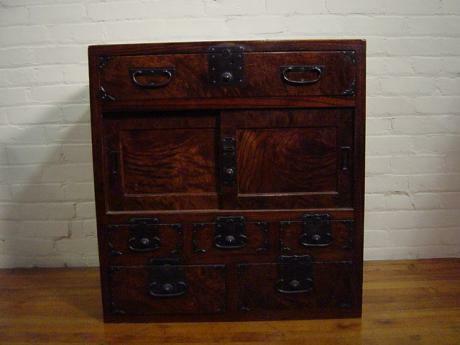 TANSU measures 42 3/4" tall by 35 3/4" wide by 17" deep. 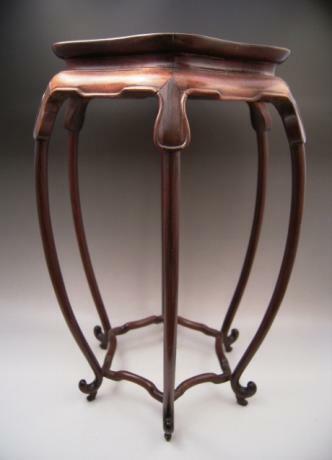 Chinese early 20th century wooden side table. The decorative hexagonally shaped wooden table has 6 gracefully curved legs. The stand measures 12" wide by 20 1/2" tall. Wonderful FUKUSHIMA TANSU. Three layers of large drawers on top and with a bottom layer with a smaller drawer on the left with 2 layers of small drawers on the right. 34" height, 34" width and 15 1/2" depth. 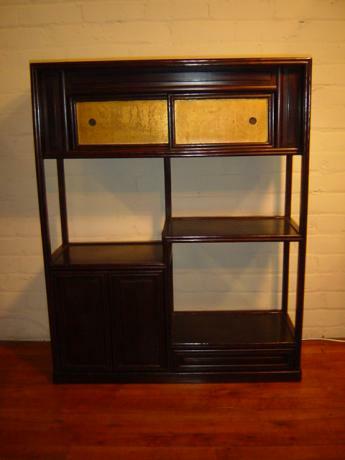 A very nice Japanese wooden cabinet with gold sliding doors. 38" tall, 30 1/2" wide and 10 1/4" deep. 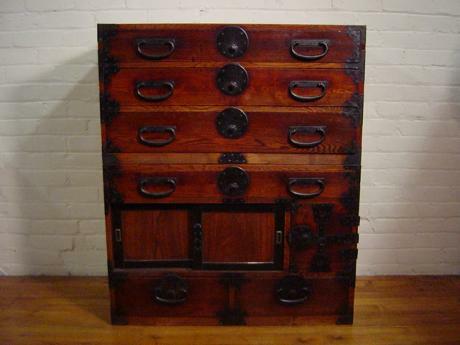 Japanese late 19th Century TANSU. Made of KEYAKI wood. The TANSU measures 40 1/2" tall by 33 1/2" wide by 16 1/8" deep. 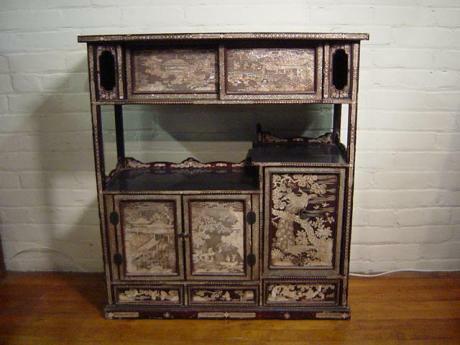 Wonderful mother of pearl inlaid cabinet. The design is a traditional Chinese landscape. The level of craftmanship shown in the inlays in very high, with minute pieces of mother of pearl cut and inlaid in amazing detail. 35" tall, 31" wide by 12 1/2" deep. 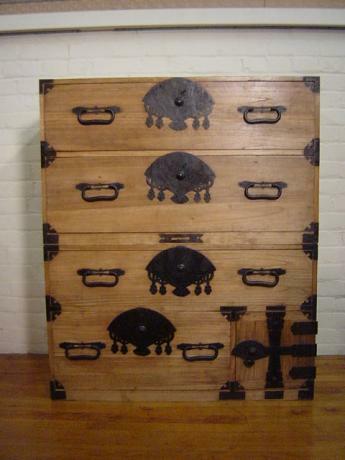 Japanese Meiji Period NIHONMATSU clothing TANSU. The outer surface is made of KEYAKI and the inner wood is cedar, outside covered with a lacquer finish. 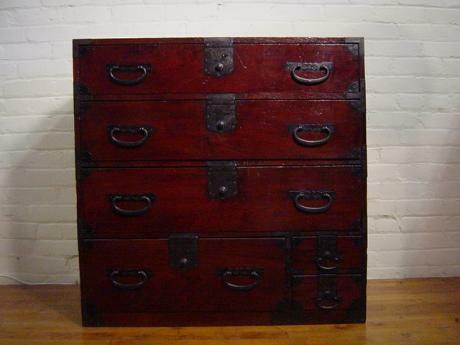 The TANSU measures 45 1/4" tall by 42" wide by 18" deep. C. 1900 Sendai TANSU. TANSU is made of KEYAKI wood front with Cedar wood box and inside drawers.